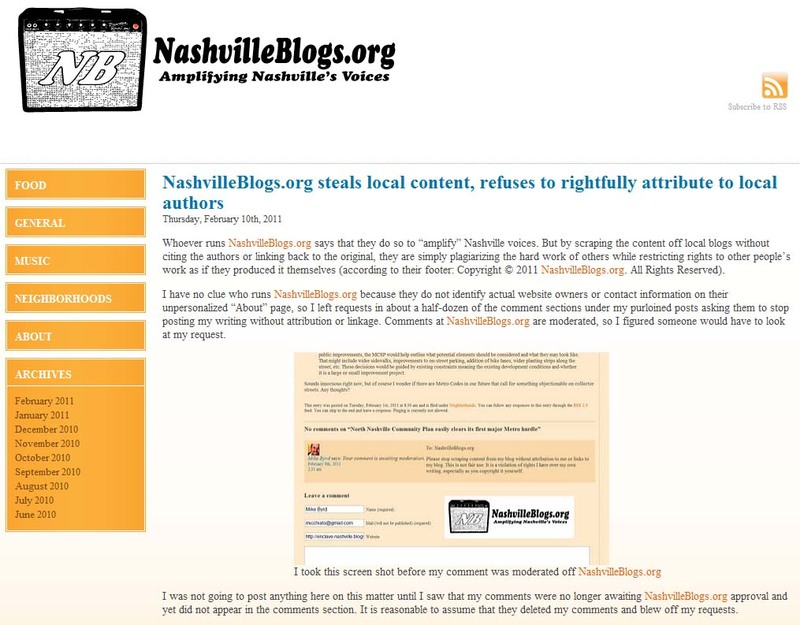 Whoever runs NashvilleBlogs.org says that they do so to "amplify" Nashville voices. 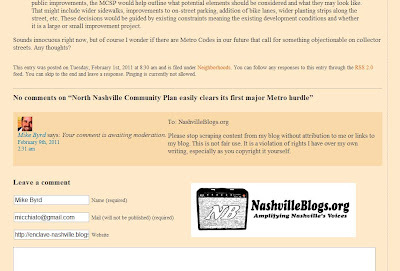 But by scraping the content off local blogs without citing the authors or linking back to the original, they are simply plagiarizing the hard work of others while restricting rights to other people's work as if they produced it themselves (according to their footer: Copyright © 2011 NashvilleBlogs.org. All Rights Reserved). I have no clue who runs NashvilleBlogs.org because they do not identify actual website owners or contact information on their unpersonalized "About" page, so I left requests in about a half-dozen of the comment sections under my purloined posts asking them to stop posting my writing without attribution or linkage. 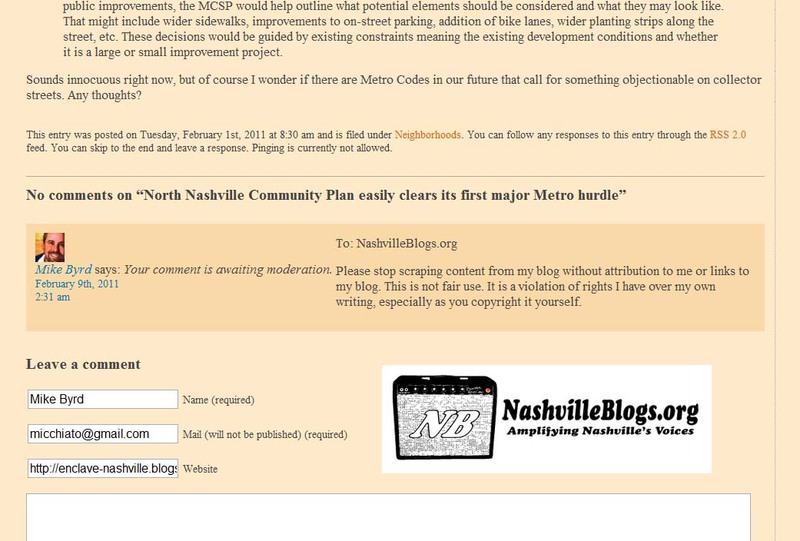 Comments at NashvilleBlogs.org are moderated, so I figured someone would have to look at my request. I was not going to post anything here on this matter until I saw that my comments were no longer awaiting NashvilleBlogs.org approval and yet did not appear in the comments section. It is reasonable to assume that they deleted my comments and blew off my requests. I will not recommend NashvilleBlogs.org to you because I believe that they are acting unethically and that they are not amplifying anyone but themselves. I do not include links to NashvilleBlogs.org in as encouragement to visit their site. Instead, my intention in linking NashvilleBlogs.org multiple times is to enhance the odds searches for NashvilleBlogs.org will include links to this criticism of NashvilleBlogs.org. UPDATE: Nashville blogger Kay Brooks finds some evidence to suggest that my attempt above to undermine content-theft may be working: good title. BLOG BUSTING: Ripping off blog content, one's writing, is a continuing problem, but a Tennessee blogger has found an interesting way of dealing with it. It's quite ridiculous that your content is being taken. I call it thievery. Even worse, the folks conducting themselves in such a manner are nothing but do-nothings. I'm sure their mothers would be sooooo proud. If they are ranking higher than you, in google page rankings, you can do up a DMCA Notice. But, you also have the opportunity to benefit from their scraping -- always link back to yourself (other posts, homepage, etc.) within new posts, as they probably won't strip the links. Unfortunately, content scraping is a huge problem, not matter what the topic of one's blog may be. Mike, how does the multiple linking work? Michael: I'm operating under the assumption that part of search engine algorithm is linkage to websites. If that is the case, perhaps multiple links to the scraper when I publish will increase the chance that this post appears in the rankings of a search for their website. There are few ways to fight scraping, but I have also activated a post feed footer function for each post, so that my name and a link back to Enclave appear in the posts on feed readers. I'm including an item about this in my Sunday column. Hey Mike, I just recently discovered that their entire FOOD section is from my blog but couldn't figure out how to contact them. I saw that some of my traffic today had come from there, so I clicked over and saw your post. I don't really understand what they have to gain from it, as all the posts are abbreviated and link right back to my site. Yeah, I did a whois search when Mike brought this up, too. That Provo address is for Bluehost, the proxy service they used to register the site anonymously. Thanks to all for the helpful information. It has been enlightening. I have had the exact same problem with all of my content from EastNashvilleBlog.com being stolen. I use a Creative Commons license that allows people to reuse my content as long as they attribute it to me. Seriously, that's all I ask, one little piece of attribution for the work I put into my blog - and this NashvilleBlogs.org site consistently fails to do so. I tried leaving a comment once - and to the best of my knowledge it's still sitting there, unmoderated, never to be read by whoever owns the site. It's enough to drive a blogger crazy. Thanks for publicizing the thievery in the way you have. A little pressure in this kind of situation is a good thing. Could Wedgewood-Houston SNAP to it? Fairgrounds 2011: who is in charge here?